Although the end of 2018 is still a long way off, my first academic year as a PhD student is now drawing to a close. The approach of the end of the year also meant that last week, it was time for my probation review. Each year, every PhD student here at the University of Leicester undergoes a review process where their work is assessed through written submissions and an oral examination. Success in the annual review means that your research is deemed to be making an original contribution to scholarship and you're given the green light to continue with your research. Failing the review means it's back to the drawing board! So, how did I get on? Spoiler alert - I passed my review! I had some great feedback from my review panel which I'm very happy (not to mention very relieved!) about. 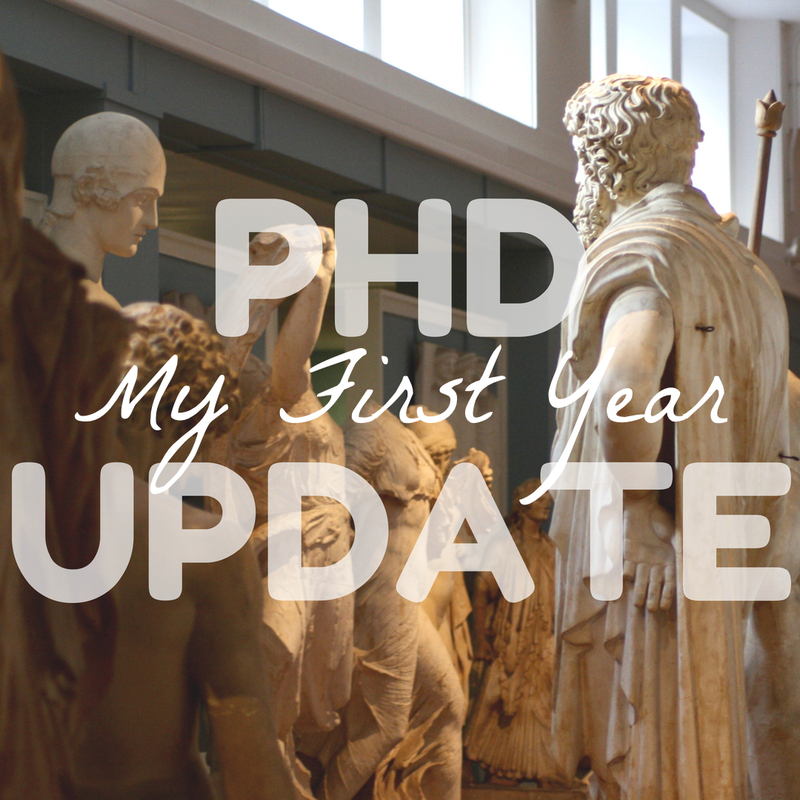 To celebrate, today I thought I'd give an update on the progress I've made so far, as well as sharing what's in store for my next academic year! You ready? This year, I've produced about 25,000 words of written work. My entire PhD will be around 80,000 words in length which sounds terrifying, but I'll get there slowly! The written work I've produced already won't just slot into the final thesis, this is just a first draft. My writing will have to go through a lot of revisions before I'm ready to submit it, and most PhD students take the entirety of their third year to write up. That's a little while off for me, but it's always good to have some words in the bank to give you a starting point. Nobody likes the feeling of sitting in front of a blank Word document after all! I'd be lying if I said that I had this whole PhD thing already figured out. I'm still battling quite a few demons with my project (and, frankly, with myself too). One of the biggest things that I have to deal with is impostor syndrome. I'm sure we've all experienced it once or twice in our lives. It's that little niggling feeling at the back of your mind that goes "you're a FRAUD, you don't belong here!". That pesky little voice will tell you that you're undeserving of your place and that you're a complete failure, ignoring any evidence to the contrary. I've spoken to so many people in the PhD community who have experienced impostor syndrome that it seems like it's par for the course, really! It's something that I need to work through and hopefully, as I gain confidence with my research, it will melt away. Committed fans of my blog (hey, Hels!) might remember that all the way back in January, I made it one of my New Year Goals for 2018 to present my work at an academic conference. Well, right now I'm halfway there and at the end of this month, this goal will be realised! I successfully (if very nervously) delivered a 20 minute talk on my work during Research Week at Leicester which was a warm-up for the conference that I'll be speaking at on June 30th, in front of leading researchers and academics in the field of Museum Studies. Eeeek. I will undoubtedly be very nervous again but I'm determined to get up there and do it, I won't let the anxiety get the better of me! 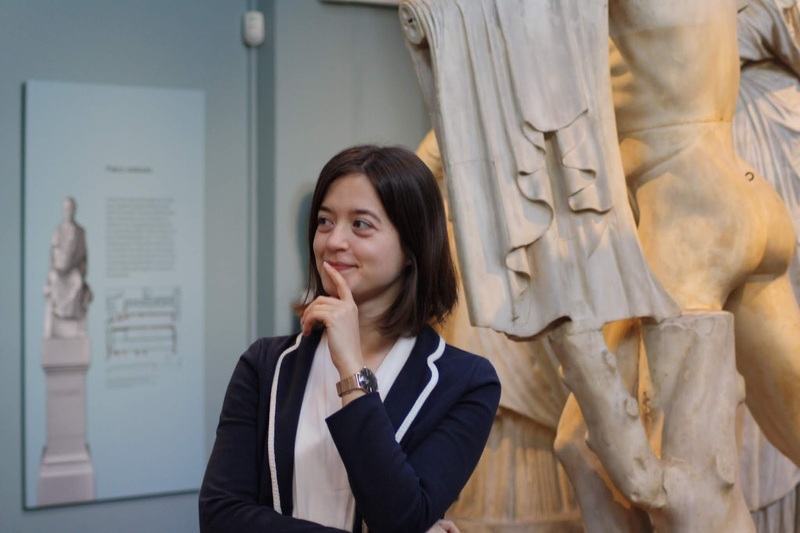 This past year, I've spent most of my time in the library, reading and writing, and not so much time actually in the museum. Next year, the museum-based fun really begins. 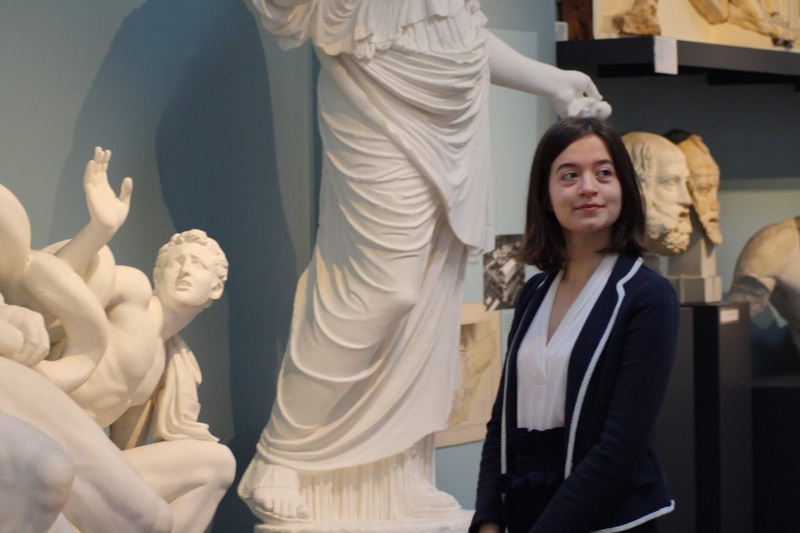 I'll start my "fieldwork" in the Ashmolean Museum's gallery, where I'll be interviewing visitors and curators. I'll really get to grips with how the museum's displays are currently working, deciding how they can be shaped in the future. As part of this, I'll be collecting a LOT of interview data. With my interviewees' consent, I will record my interviews using an audio recorder, but the data processing doesn't end there. I will have to transcribe the entire interview into a text format to be able to analyse it properly, which, if I do this manually, will take up a huuuuge amount of time. Thankfully, I have some tools in my arsenal to help me out. The first is an audio and video transcription service that goes by the name of Trint. I was kindly gifted a trial of their software to review and I must say that I was incredibly impressed. I've used many text-to-speech services in the past for note taking and to be honest, they've always been a bit useless. Specialist academic jargon is something that most text-to-speech services simply cannot handle, the text that results is just gobbledeygook! Trint, however, did an admirable job of the audio recording that I threw at it. As part of my test, I recorded a short clip of myself waffling on about my research, using lots of words that I know will come up frequently in my interviews, and the accuracy of the transcription was very impressive. If Trint doesn't know a word that pops up a lot in your text, you can teach the software the additional vocab, which is amazing. You can also edit the transcription in the programme with ease to correct any mistakes in the grammar or punctuation. Another great feature was that Trint allows you to export your transcribed text into a Word document. And the best part? Transcribing the text through Trint takes about the same length of time as it would for you to play back the audio file. AMAZING. I will most definitely be using Trint as part of my data processing work next year, I'm delighted to have found this service! Trint would also be fantastic for students who record their lectures and for professionals working in journalism or broadcasting. What's more, Trint's video to text transcription software is also available via Adobe Premiere Pro, so there are plenty of ways to make the most of this brilliant service. Although snazzy software is incredibly handy in many cases, sometimes you just can't beat the good old fashioned pen and paper methods. That's why I was over the moon to be gifted some gorgeous stationery by Oxford Campus to be used in my second year. 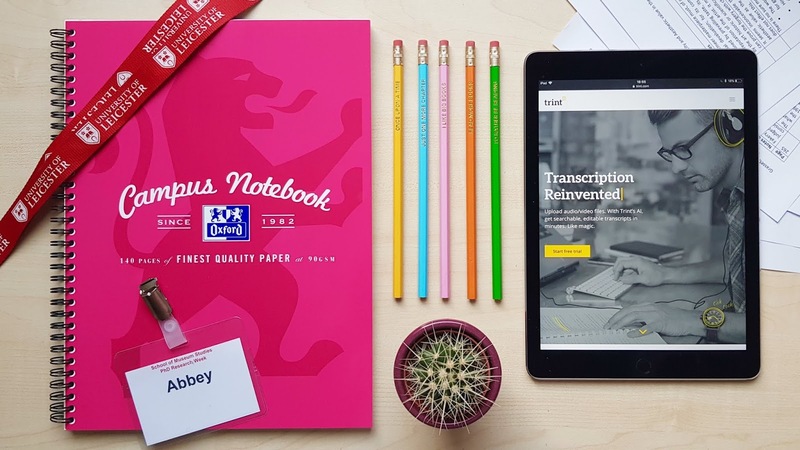 I've been a massive fan of this brand for ages now, both their wirebound notebooks and refill pads are some of the best quality options out there for students. The 90 GSM paper means that your pen just glides across each page, which makes writing a really smooth and enjoyable process. I particularly love the A4 Project Books from the Oxford Campus range, which includes removable dividers to help organise your work. All of these products are available on Amazon and I highly recommend them to my fellow students. And there you have it, my first year as a PhD student in a (very large) nutshell! If you have any questions about PhD life, university applications in general, or about my experiences of undergraduate study, don't hesitate to ask. Speaking of studying, what were your favourite - and least favourite - subjects to tackle in school? Leave a comment and let me know!